These aren't your average dark chocolate brownies. 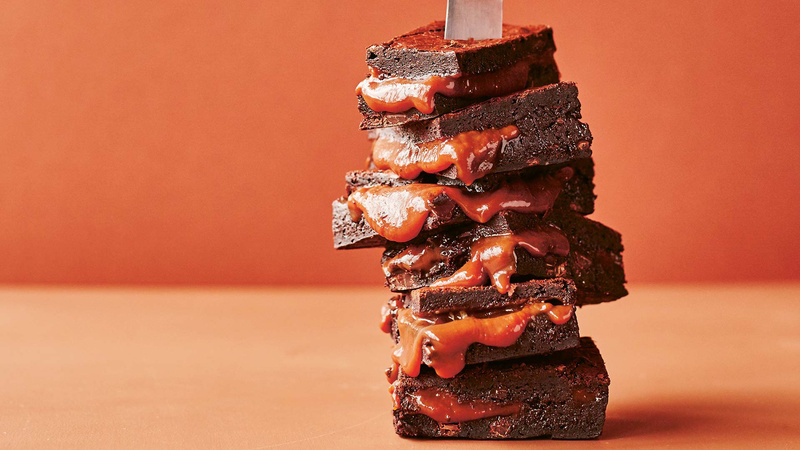 In the words of Chloe Timms – owner of Fatties Bakery and all-round salted caramel queen – the rivers of salted caramel and warming winter spice make these the "Ohh, baby..." of the brownie world. Preheat the oven to 170°C. Butter and line a 30×20cm brownie pan with baking parchment. Sift the flour into a bowl and add the sea salt. In a separate bowl, whisk together the cocoa and espresso powders. Weigh out the sugar in another bowl and the chocolate chips in another. Gently melt the butter in a large saucepan over a medium heat. Remove the melted butter from the heat and using a rubber spatula gently mix in the cocoa and espresso powders and stir to a smooth paste. Add the sugar in three stages, mixing thoroughly but gently to obtain a thick paste. Add the eggs two at a time, beating well but not vigorously so you incorporate as little air into the mix as possible. Fold through the flour and salt mix and then the chocolate chips until thoroughly combined. Pour two-thirds of the brownie batter into the prepared brownie pan and smooth to form an even layer. Dollop the cold salted caramel over the top. The larger the dollops, the more extreme the pockets of caramel in the finished brownies – if they are smaller, you'll get a more uniform layer. Working quickly before the mixture cools and seizes, ripple over the remaining one-third of the brownie batter to cover the entire surface of the previous layers. Bake for 20–25 minutes, or until firm around the edges but still slightly jiggly in the middle. Leave to cool in the pan, then refrigerate for at least 4 hours before cutting. Brownies are best stored in the fridge for up to one week.